Jimmie Lee and the posse take to the streets for the best in ad lib uncensored street comedy skits! …"Pure pandemonium and mayhem, no holds barred, uncanny, unpredictable, zany and pure entertaining". LAS VEGAS, NV, May 29, 2018 /24-7PressRelease/ -- Jimmie Lee- The Jersey Outlaw- has premiered with the hottest comedy reality show "Dangerously Funny", that hits TV on June 1, 2018. Jimmie and his posse of models and security guards take to the streets all over the country for the funniest street comedy you will ever see. Jimmie has exploded into the comedy world with his unique brand of comedy that incorporates street comedy with ad-lib off the cuff uncensored skits that are hilarious. Jay Cohen from the Las Vegas Sun says it best…"Pure pandemonium and mayhem, no holds barred, uncanny, unpredictable, zany and pure entertaining". Jimmie Lee's new comedy TV show has taken him all over the country, including stops to South Beach, Las Vegas, Beverly Hills, London, Atlantic City, New York, Asbury Park and more! 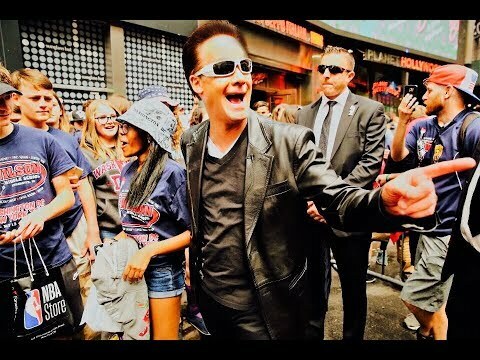 And recently, New York City got a taste of the Jersey Outlaw….. when Jimmie Lee and top notch security guards, hit the streets of Times Square for a wild and crazy time, and The Outlaw had people cracking up all day. Jimmie Lee is no new comer to comedy. Jimmies comedy is an old school Vegas style, that combines elements of Rickles, Dangerfield, and Red Foxx, with a unique style and smooth delivery with some Jersey attitude. He has been performing since 2013 and has performed in major clubs throughout the country, that include stops to The Icehouse Comedy Club in Pasadena, HaHa Comedy Club in L.A., Comedy Crap Shoot in Atlantic City, Stand Up NY, The Meadowlands Comedy Club, Comedy Cabaret in Philly, Sapphire Comedy Club, Off The Hook Comedy Club and many more! Also, he has spook comedy reels, One F*&^ed Up Dentist, that have garnered national attention on YouTube. Ethan and Hila, Famous YouTube personalities from h3h3 productions, have done several reaction videos to Jimmies reels. Now, back to the really big show!! And away, we go!!! The limo door opens…..and Jimmie and the BanditoGirls exit, The Outlaw appears in the leather coat and dark sunglasses, jostling and kibitzing with the crowds, as he combines one liners, zingers, short bits, pranks and antics, creating a scene wherever he goes. Jimmies off the cuff delivery, coupled with the one liners and his dynamic persona are trademarks that have made Jimmie Lee a big name in the comedy world. Nobody's safe, when Jimmie hits the streets. So, lock the doors and call the cops. The Jersey Outlaw is in town! The Outlaw is definitely a character and goes to extremes to entertain and keep everybody on the edges of their seats. The kids got charisma and a touch of old school class! In this crazy world of entertainment, The Garden State can take pride to one outlaw of a good nature. That's Jimmie Lee and he's one of a kind. For more on Jimmie Lee, go to www.jimmieleecomedy.com, Jimmie Lee-The Jersey Outlaw- YouTube Channel, and Facebook- Jimmie Lee.